Mount Warning (Aboriginal: Wollumbin), a mountain in the Tweed Range in the Northern Rivers region of New South Wales, Australia, was formed from a volcanic plug of the now-gone Tweed Volcano. The mountain is located 14 kilometres (9 mi) west-south-west of Murwillumbah, near the border between New South Wales and Queensland. Due to Mount Warning's proximity to Cape Byron, the Australian continent's easternmost point, it is the first place on mainland Australia to receive the sun's rays each day. Lieutenant James Cook saw the mountain from the sea and named it Mount Warning. He also named a bit of land jutting out of the shoreline as Point Danger (later known as Fingal Head). Together they were named as a point of reference to warn other explorers that came afterward. This image belongs to the travel and nature stock photo library. 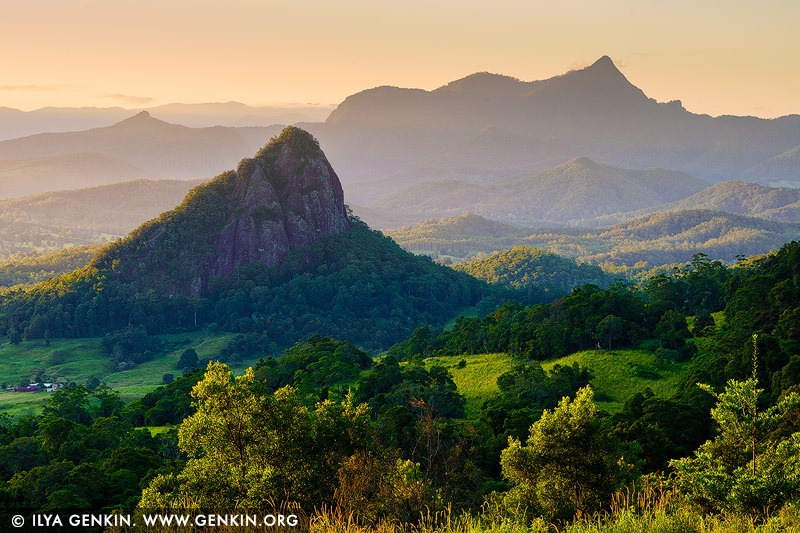 This stock photo of Mount Warning at Sunset is available for licensing for commercial and editorial uses including websites, blogs, books, magazines, brochures and advertising. Restrictions may apply for images which contain third party copyrighted material or sensitive subjects. Photos of artwork are for editorial use only. This image id AU-MOUNT-WARNING-0001 of Mount Warning at Sunset, is copyrighted © by Ilya Genkin. This is not a public domain image.